Thank you Anna for introducing me to Alabama Chanin, and while I cannot afford the clothing (don't you just love how comfortable they look though - I want that white tunic top, and the swing jacket is just amazing! ), I picked up a copy of the book. No time yet for a hand stitched skirt, though I am looking forward to that project. Instead, I went with the no-sew idea of repurposing a T-shirt. Results: the above pictured top - a $7 cotton jersey knit tee, cut up the middle! Decorative pin that has been tucked away in the jewelry drawer for 15 years (an old piece of my mother's) used to close the opening, and there you have it - a perfect top to go with the $6 consignment store "dress" I wear as a skirt! What is your favorite fashion for a steal? Okay my dear friend, all I can say is I thought the photo was from the picture of the site you mentioned. you look lovely and that shirt is gorgeous! love to you this evening! I agree with Elizabeth! And what a genius idea. Elizabeth - so sweet :) thanks for the compliment! Sh. Patty - yes! 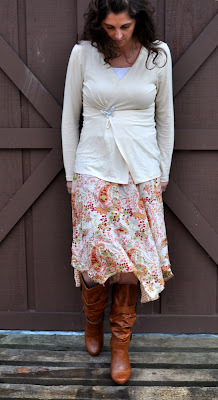 some of my favorite skirts are strapless/tube dresses from the consignment store - I have even taken some of the summer maxi dresses and cut the top off and added an elastic waistband. Are you living in Zerrissenheit?